The organizer of the world’s leading business awards programs invites you to submit nominations to the 2016 (second annual) German Stevie Awards. Welcoming nominations from all organizations with operations in Germany, the final entry deadline is five days away on Tuesday, January 26.
REVIEW THE ENTRY KIT HERE. The German Stevie Awards is the second national Stevie Awards program, after the 14-year-old American Business Awards. 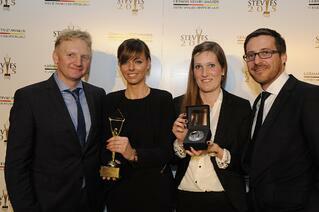 The first German Stevie Awards was a great success. “In 2015 we received a great variety of compelling entries from organizations all over Germany. We look forward to even more companies and individuals being recognized for their innovations this year”, said Michael Gallagher, the president and founder of the Stevie Awards. New categories this year include Best E-Book and Best Business Book. The Startup of the Year and Technology Startup of the Year categories have a small fee of only 35 Euros. Judging for the competition will be conducted in two rounds. The first round will determine Gold, Silver and Bronze Stevie Award winners in each category. Those winners will be announced on February 24 at a press conference. All of the Gold Stevie Award winners will then compete in the second round of judging for the right to be named the Grand Stevie Award winner in their category groups. Gold, Silver and Bronze Stevie winners will be honored, and Grand Stevie Award winners announced, at a gala awards banquet in Munich at the Hotel Vier Jahrezeiten Kempinski on April 8, 2016. Some of last year’s German Stevie Award winners included Black Lane GmbH, CCC, JUNIQE, Feingold Technologies GmbH, Emanate PR, Coca-Cola Germany, Sky Germany, SATTLER, and MID GmbH, among others. To learn more about the German Stevie Awards, visit our Frequently Asked Questions webpage at http://www.stevieawards.com/pubs/gsa/about/514_2923_24742.cfm. Stevie Awards are conferred in six programs: The American Business Awards, the German Stevie Awards, The International Business Awards, the Stevie Awards for Women in Business, the Stevie Awards for Sales & Customer Service, and the Asia-Pacific Stevie Awards. Honoring organizations of all types and sizes and the people behind them, the Stevies recognize outstanding performances in the workplace worldwide. Learn more about the Stevie Awards at www.StevieAwards.com, and follow the Stevie Awards on Twitter @TheStevieAwards.